I would like to ask the help of this group to evaluate whether the origin of the vertebrates is a case of detectable divine intervention. Feel free to add additional scientific information in order to inform this discussion. The first animal life in the fossil record is 580 Ma, the Avalon Explosion. A vertebrate lamprey fish appears in the fossil record (chordate) in the Chengjiang Lagerstatten (517 Ma). DNA molecular analysis indicates that a vertebrate fish could not evolve within 60 million years. A cephalochordate (Cathaymyrus) appears in the same Chengjiang formations. Vertebrates are strongly linked to cephalochordates such as amphioxus by physiology and DNA. The lamprey larvae is similar to adult cephalochordates. Most of the vertebrate novelties are formed by neural crest cells, which are lacking in cephalochordates. My hypothesis is that God modified a cephalochordate by with neural crest cells in order to form the ancestor of all vertebrates. I made a table of some of the differences between cephalochordates (amphioxus) and the lamprey fish that was found at Chengjiang (Haikouichthys). DNA molecular analysis indicates that a vertebrate fish could not evolve within 60 million years. Wait what? Could you help me with this as I can’t go further in your post until you help me see this is indeed the case. The insertion was, after all, detectable. 60 million years to make these alterations seems like a long long time for the operation of divine abra-cadabra. If 60 million years really isn’t long enough for evolution to produce these changes then it is far more likely that it is the 60 million year estimate which is wrong. Figure 2 in the attached link shows the divergence of the bilateria (protostomes and deuterostomes) at 680 Ma. The figure was constructed by Erwin in 2011, who is one of the leaders in this research field. This figure represents a typical molecular clock estimate of the origin of bilateria. Note that the bilateria were not the first animals but would have evolved from the basal animals. Peterson, Kevin J., and Douglas J. Eernisse. 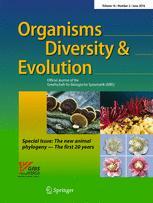 “The phylogeny, evolutionary developmental biology, and paleobiology of the Deuterostomia: 25 years of new techniques, new discoveries, and new ideas.” Organisms Diversity & Evolution 16, no. 2 (2016): 401-418. Does the paper support your claim in any kind of way? Or how are you coming to this conclusion? That is a good point. Thank you. I will rephrase the statement. Based on genome differences alone, Erwin’s DNA molecular clock analysis estimates that protostomes and deuterostomes diverged 680 Ma, which is 120 million years prior to the first appearance of protostomes and deuterostomes in the fossil record. The first vertebrate appears 40 million years after (558 Ma - 517 Ma) the observed divergence of protostomes and deuterostomes in the fossil record, which is 4 times less time than Erwin’s estimate of (680 Ma - 517 Ma) of 160 million years. One other thing I wanted to point out in Figure 2. Notice the relatively short length of time between the divergence of bilateria and the appearance of chordata and the relatively long interval before the appearance of vertebrates. I recommend this recent piece on uncertainty and current proposals in very early animal evolution. Based on genome differences alone, Erwin’s DNA molecular clock analysis estimates that protostomes and deuterostomes diverged 680 Ma, which is 120 million years prior to the first appearance of protostomes and deuterostomes in the fossil record. The first vertebrate appears 40 million years after (558 Ma - 517 Ma) the observed divergence of protostomes and deuterostomes in the fossil record, which is 4 times less time than Erwin’s estimate of (680 Ma - 517 Ma) of 160 million years. Recent molecular clock studies date the origin of Metazoa to 750–800 million years ago (Ma), roughly coinciding with evidence from geochemical proxies that oxygen levels rose from less than 0.1% present atmospheric level (PAL) to perhaps 1–3% PAL O2. A younger origin of Metazoa would require greatly increased substitution rates across many clades and many genes; while not impossible, this is less parsimonious. Yet the first fossil evidence for metazoans (the Doushantuo embryos) about 600 Ma is followed by the Ediacaran fossils after 580 Ma, the earliest undisputed bilaterians at 555 Ma, and an increase in the size and morphologic complexity of bilaterians around 542 Ma. This temporal framework suggests a missing 150–200 Myr of early metazoan history that encompasses many apparent novelties in the early evolution of the nervous system. This span includes two major glaciations, and complex marine geochemical changes including major changes in redox and other environmental changes. One possible resolution is that animals of these still unknown Cryogenian and early Ediacaran ecosystems were relatively simple, with highly conserved developmental genes involved in cell-type specification and simple patterning. In this model, complex nervous systems are a convergent phenomenon in bilaterian clades which occurred close to the time that larger metazoans appeared in the fossil record. The Doushantuo embryos (600 Ma) that Erwin mentioned are extremely controversial. They may be microbes, phosphatic grains, multicellular microorganisms, or early embryos, all of which have a similar shape. It is rather entertaining to read the decade-long back and forth on the interpretation of these embryos. I have included two recent papers here. Crosby, C. H., and J. V. Bailey. “Experimental precipitation of apatite pseudofossils resembling fossil embryos.” Geobiology 16, no. 1 (2018): 80-87. Yin, Zongjun, Duoduo Zhao, Bing Pan, Fangchen Zhao, Han Zeng, Guoxiang Li, David J. Bottjer, and Maoyan Zhu. “Early Cambrian animal diapause embryos revealed by X-ray tomography.” Geology 46, no. 5 (2018): 387-390. I would like to point out the following paper regarding animal evolution prior to 580 Ma. As the authors state, the supposed chemical evidence of sponges is probably incorrect and.this adds further uncertainty to the rise of animals prior to 580 Ma. I think that the evidence points toward an explosive rise of the animal kingdom in the Avalon Explosion at 580 Ma. Nettersheim, Benjamin J., Jochen J. Brocks, Arne Schwelm, Janet M. Hope, Fabrice Not, Michael Lomas, Christiane Schmidt et al. "Putative sponge biomarkers in unicellular Rhizaria question an early rise of animals." Nature ecology & evolution (2019): 1. Erwin states that the animal kingdom must have originated 750 to 800 million years ago, which is an estimate constrained by the complexity of vertebrate DNA. This is incorrect. It is an estimate based on molecular clock methods. That’s just one piece of evidence, and it must be considered alongside fossil evidence and geological evidence. That is the whole point of both papers I cited. Your claims about the estimates being “constrained” are inaccurate. By the way, “the complexity of vertebrate DNA” is a meaningless phrase; DNA is the same whether it’s from vertebrates or bacteria, and “complexity” is unrelated to molecular clock estimates. This is incorrect. It is an estimate based on molecular clock methods. That’s just one piece of evidence, and it must be considered alongside fossil evidence and geological evidence. Thanks for pointing out the difference between complexity and size. While the vertebrate genome is far more complex, it is also much larger than invertebrate genomes. This would agree with the Figure 2 that Pevaquark posted. The divergence time from the initial bilaterian divergence to the chordates is very short while the vertebrate divergence time from the initial chordate much longer. 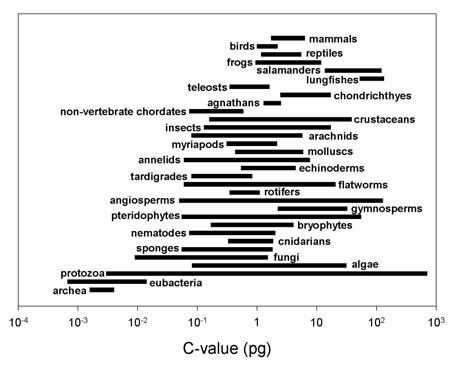 The vertebrate genome is 4 x more complex (large) than the basal chordate genome (amphioxus). I assume that the major reason for the extended time of evolution from chordates to vertebrates is due to the size of the vertebrate genome. I don’t think that Erwin constrained his molecular clock estimates by the geologic and fossil record. My understanding is that this technique is called Bayesian analysis. If he had, then he would have estimated the origin of the animal kingdom at 580 Ma or 630 Ma, or at some point prior to the oldest fossil that he considered to be an animal. Rather, I think that Erwin based his molecular clock estimate on his estimated rate of DNA mutation. This is incorrect. It is an estimate based on molecular clock methods. Actually, I might have gotten it wrong. The chordate divergence from protostomes does not imply that it was amphioxus that was at that point. Sorry about that. However, what do you think about the size of the vertebrate genome being the main cause of the extended time of divergence. Hi! Loving the amount of information that you guys are sharing on this topic. I am new to this forum and would love to learn and share a lot of knowledge as we grow together. And Yes! I agree with Peter on this up to some extent. Welcome to the forum. Yes we are all learning. What I love about this forum is people challenging ideas. I have been reading the papers that have been shared. Erwin proposes some hypotheses to explain the “150 to 200 million year gap in animal evolution” and particularly the development of the nervous system of vertebrates. It will be interesting to explore these hypotheses. Thanks for pointing out the difference between complexity and size. I didn’t do that, and don’t know why you wrote that. While the vertebrate genome is far more complex, it is also much larger than invertebrate genomes. This is false in a few different ways. First, there is no single “vertebrate genome.” There are thousands and thousands, and they vary dramatically in size. Second, invertebrate genomes vary even more in size, and many of the largest genomes on the planet are those of invertebrates. So again: I don’t know why you wrote that. For basic information on genome sizes in animals, see the excellent database run by Ryan Gregory. This figure shows at a glance why your claim is incorrect. I assume that the major reason for the extended time of evolution from chordates to vertebrates is due to the size of the vertebrate genome. I don’t know why one would assume that. I don’t even know why one would think the premise (about size) is true. I don’t think that Erwin constrained his molecular clock estimates by the geologic and fossil record. That sentence doesn’t make any sense. The molecular clock can be calibrated, or simply put into context with other data. It isn’t “constrained” by other data. My understanding is that this technique is called Bayesian analysis. Bayesian analysis is a tool for analyzing molecular clock data. Rather, I think that Erwin based his molecular clock estimate on his estimated rate of DNA mutation. Molecular clocks are all, by definition, based on DNA mutation. Welcome @jakesantiago ! What do you agree with Peter on exactly? For basic information on genome sizes in animals, see the excellent database run by Ryan Gregory . This figure shows at a glance why your claim is incorrect. I looked up the size of the amphioxus genome at the website that you pointed me to, and you are correct. The smallest bony fish genome is approximately the same size as the size of the amphioxus genome, assuming I did the following C value base pair calculation correctly. So you are correct that the size of the genome is not related to complexity, if that is what you said. The reason that I assumed that the ancestral vertebrate genome was 4X larger than the ancestral amphioxus (and invertebrate protostomes) genome is the concept of the 2X Whole Genome Duplication event, which apparently, although controversial, is still something that many scientists advocate. For example, the following paper endorses it. Sacerdot, Christine, Alexandra Louis, Celine Bon, Camille Berthelot, and Hugues Roest Crollius. “Chromosome evolution at the origin of the ancestral vertebrate genome.” Genome biology 19, no. 1 (2018): 166. The reason that I assumed that the ancestral vertebrate genome was 4X larger than the ancestral amphioxus (and invertebrate protostomes) genome is the concept of the 2X Whole Genome Duplication event, which apparently, although controversial, is still something that many scientists advocate. Ah, I see. You wrote your comments about extant genomes, but yes, there seem to have been 2 WGDs back then, somewhat close together. It’s not quite right to assume that this means a 4-fold difference in size, because there is always fairly rapid loss of genes (and other content) after WGD.